Have you completed an Ironman Triathlon and have the finisher photos sat on your computer or in a Facebook album? Have you often thought I would love to do something special with the pictures but never know what to do? Well. Look no further as we at Canvasdesign have come up with a personalised solution. Ironman Triathlon Canvas Prints are a great way to display your special day on a completed photo montage. We will take your finisher pictures, arrange them on a classy collage layout, add your finisher location title and we will put your finishing time on the montage too. Ironman Triathlon canvas prints make perfect customised gifts for that person who has everything. 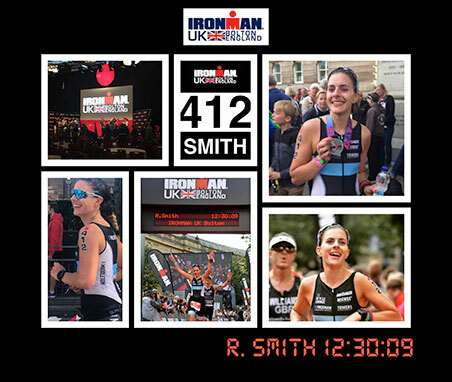 Totally personalised and unique, you will be hard pushed to find a more unique idea to display your Ironman photos. Why an Ironman Triathlon Collage? A stunning and simple Photo Montage of your Ironman day. You can have up to 6-12 photos on this very simple layout. Ironman canvas prints suit the Landscape orientation better but we can also make them in to portrait format. Please make sure you email us the location of the Ironman triathlon, the name of the athlete and the finishing time so we can add all of this to the collage.